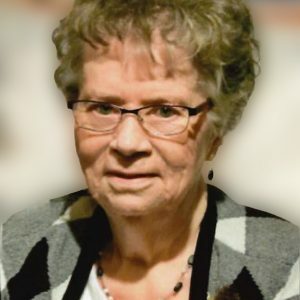 Audrey Meierhofer of Watkins died Saturday, March 23, 2019, at Cherrywood Advanced Living in Richmond. She was 81. Mass of Christian Burial will be held at 11 a.m. Wednesday, March 27, at St. Anthony Catholic Church in Watkins. Burial will be in the parish cemetery. A gathering of family and friends will be from 4-8 p.m. Tuesday, March 26, at the Wenner Funeral Home in Richmond, and will continue at 9:30 a.m. Wednesday at the church. Audrey was born Feb. 23, 1938, in Albany to Frank and Gertrude (Kohorst) Wohletz. She married Gerald Meierhofer June 2, 1959, in Seven Dolors Catholic Church in Albany. Audrey was a homemaker, farm wife, and a cook in food service. She enjoyed flowers, cardinals, bingo, playing cards, puzzles, family gatherings, and especially her grandchildren and great-grandchildren. Audrey was preceded in death by her husband Gerald, and brothers Donald Kleve, Roger Wohletz, and Frank Wohletz Jr.
She is survived by her children Tim (and Shirley) Meierhofer, Brian Meierhofer, John (and Stephanie) Meierhofer, Deanna (and Arne) Frank, and Jenny (and Mike) Ebensteiner; siblings Eileen Dingmann, August (and Shirley) Wohletz), and Judy (and Rich) Mareck; sister-in-law Kathy Wohletz; grandchildren Chad, Nick, Heather, Melissa, Tanner, Breane, Travis, Jordan, Noah, Addy, and Isaac; and eight great-grandchildren. Audrey’s family would like to thank the staff at Cherrywood Advanced Living and St. Croix Hospice for the wonderful care of their mother.